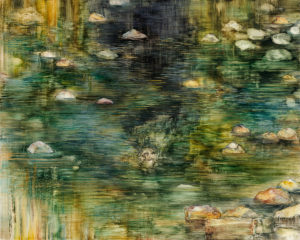 James Harris Gallery | Mary Ann Peters: "what stays the same is never so"
James Harris Gallery is pleased to present what stays the same is never so, an exhibition of new work by Mary Ann Peters. Drawing inspiration from the colliding narratives that inform Arab culture, Peters uncovers the multiple truths and inconsistencies of a singular history. For this project, Peters uses two points of departure, the migration out of the Near East (Syria and Lebanon) at the turn of the 20th century into the Americas and the documentation of incidents as recorded by citizen journalists, then and now. The artist, a second-generation Lebanese American, examines disparate and often conflicting vantage points in her work to retell a history that is constantly in a state of flux, subject to the interpretative lens of shifting contexts. Through dynamic abstraction and timeless symbolism, this exhibition offers a fresh perspective to help resituate a history and cultural identity that has been convoluted by recent events. In this way, it intensifies an experience of nostalgia for a fixed past, which remains the same only in memory. 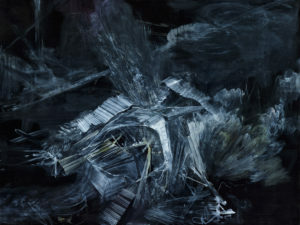 The exhibition will consist of large and intimate scale work. In the past, Peters has worked across disciplines. This exhibition will include both painting and a site specific work, the core of her artistic practice, but also altered photographs and sculpture. By shifting between referential imagery and abstraction, the works in the show engage in an intimate conversation about identity and place that although rooted in a very real discourse about the world, essentially eschews definition. The subtle spatial and narrative ambiguities present in this body of work speak to the critical areas of unclaimed landscapes both fictive and real, emphasizing the fluctuating nature of identity and the notion that one’s sense of place is often much bigger than the sum of its parts. 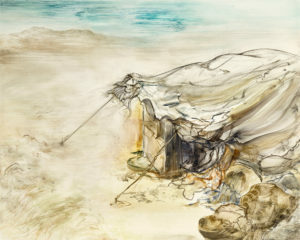 A series of small-scale paintings depict narrative scenes of one individual’s experience that act as documentary truths. 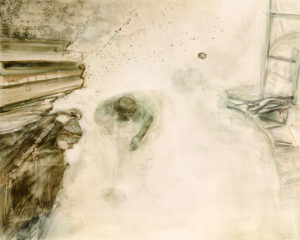 Peters paints these moments as if in situ; but these contemporary images are sourced, sometimes from simultaneous events. This series called “storyboards” examines the cross over between the personal and speculated experience through her amalgamation of first and secondhand accounts. 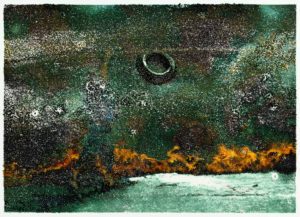 In this vein, the artist’s mixed media work, “what stays the same is never so” references a type of mapping called spidering that is used in contemporary fact finding to define demographics. 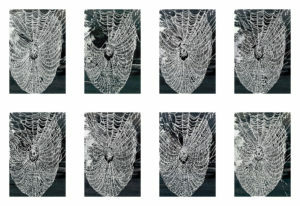 A series of eight identical photographs of a spider web shifts slightly under hand drawn reiterations of the web’s pattern. This repetition of similar yet distinct forms relates to Peters’ interest in the topic of migration and how people move and redefine themselves. 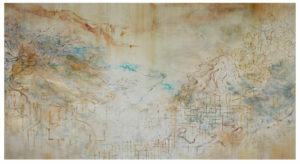 The artist considers the notion of mapping and territory to be the conceptual overlay for much of the work in the exhibition. Also included in this exhibition is a large-scale tapestry, an art form typically associated with idealized scenes. 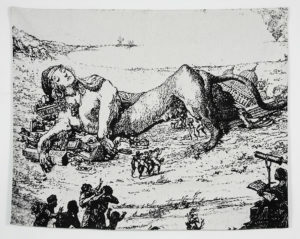 However, in this piece entitled “history lesson”, Peters subverts this intentionally apolitical tradition and uses sourced imagery she found in a political cartoon that referenced the French occupation of North Africa. The artist has provocatively stripped the image of particular references to France to allow any country that practices sublimation of another culture to be implied. The central figure of the work is a hybrid mythological creature, part woman part lion, that becomes a stand in for the motherland, always an elusive and potentially oppressive notion. 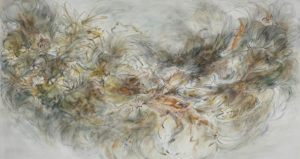 A large-scale painting, “messy heaven”, responds to questionable and sometimes heinous actions used to access an enviable afterlife. She sees heaven as a complicated idea of nirvana where events and needs are often predicated on the times in which we live. In a way, moments in history ricochet off one another creating a path to upheaval and redemption. what stays the same is never so, is a visual examination of history and how time shapes and redefines it. Our attachment to history often compromises the fact that the world is in a constant state of flux. 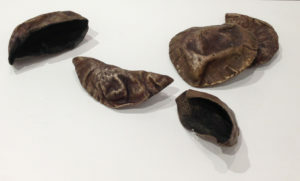 While the artist examines a particular cultural history, her intention is to reveal correlations and discrepancies in a broader human record. Mary Ann Peters lives and works in Seattle, WA. She has received numerous awards including a 2013 Art Matters Foundation Grant (NYC) that allowed her to travel to Paris and Mexico City to research a migration out of the Middle East to the Americas at the turn of the 20th c., a grant from The New Foundation, Seattle in 2014 for travel support, a MacDowell Fellowship in 2010, a Jentel residency in 2009, the Northwest Institute of Architecture & Urban Studies in Italy (NIAUSI) residency in 2003 and the Neddy Painting Fellowship from the Behnke Foundation in 2000. 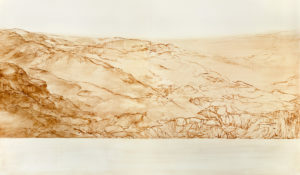 Mary Ann Peters, "storyboard (4)"
83" x 144" x 26"